The biggest anti-terrorism operation of this year is underway in the forests on the border between the Russian republics of Chechnya and Ingushetia. It’s been over a week since police began fighting a large group of Islamist militants. Interior ministry units from all over the North Caucasus region have cornered the well-armed gang of around 30 people, with foreign mercenaries reported to be among them. Police say the group is led by top Chechen terrorist Doku Umarov. The 45-year-old is one of Russia's most wanted men, and is accused of carrying out numerous terror attacks. He's thought to be behind the Beslan school siege in 2004 that ended in a blood-bath. Officials say they face a difficult enemy as the Islamist militants are not afraid to die, believing their cause will win them a place in paradise. However, the militants are suffering casualties, some of their leaders have been killed, and their morale is low. In a Saturday gun battle in Ingushetia, three policemen have been wounded and one militant killed, along with fifteen captured. On Friday last week, a suicide bomber killed two and injured five outside the Interior ministry in Grozny. It was the first act of terror since the decade-long counter-terrorist operation was officially concluded in the republic in mid-April. 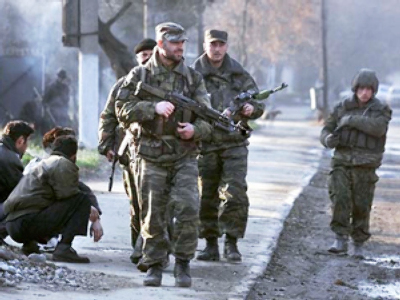 It prompted the joint operation between Ingushetia and Chechnya. Recently, Chechnya’s President announced an amnesty for all militants who laid down their arms. But after Friday’s bombing, the policy changed to no mercy, with a shoot-to-kill order on anyone resisting arrest. The Chechen Republic’s President Ramzan Kadyrov seems determined to fight until the end against the Islamic militants. But while the bombs continue to go off, the roads remain mined, and bodies continue to be brought in, people here will still fear terrorism. At an Ingush village not far from the battle scene, people are tired of living in constant danger, but are too scared to speak out about their enemy. People fear speaking on camera here, worried of reprisal attacks from the Islamic militants still holding out in the surrounding forest. Earlier on Thursday morning, a large militant base designed for long-duration stays has been found and destroyed, Interfax news agency reports. The operation was carried out in a wooded area near the town of Chemulga in Ingushetia by a Chechen Interior Ministry’s subdivision. “We are certain that there are at least several gravely wounded militants,” Col. Roman Edilov, acting Chechen interior minister, told Interfax. “The inspection of the base revealed a large amount of food products, medications, dry meat, bed sheets, and gear,” he added.